Operation Northwoods was a 1962 plan by the U.S. Department of Defense to stage acts of simulated or real terrorism on US soil and against U.S. interests and then put the blame of these acts on Cuba in order to generate U.S. public support for military action against the Cuban government of Fidel Castro. As part of the U.S. government's Operation Mongoose anti-Castro initiative, the plan, which was not implemented, called for various false flag actions, including simulated or real state-sponsored acts of terrorism on U.S. and Cuban soil. The plan was proposed by senior U.S. Department of Defense leaders, including the Chairman of the Joint Chiefs of Staff Lyman Louis Lemnitzer. 1. 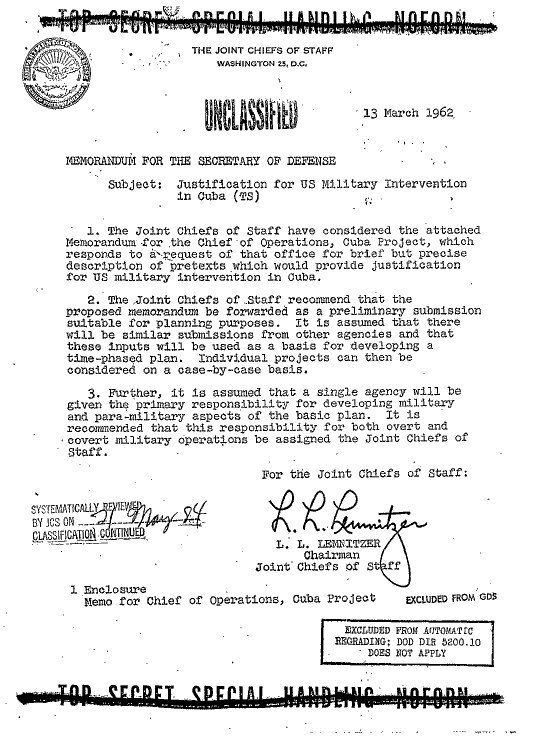 The Joint Chiefs of Staff have considered the attached Memorandum for the Chief of Operations, Cuba Project, which responds to a request of that office for brief but precise description of pretexts which would provide justification for US military intervention in Cuba. 3. Further, it is assumed that a single agency will be given the primary responsibility for developing military and para-military aspects of the basic plan. It is recommended that this responsibility for both overt and covert military operations be assigned the Joint Chiefs of Staff. Φ Use benefits to buy a house!